This was posted on November 28, 2010. Currently there are no regular PEOPLE PROJECT meetings. If you have ideas for days and times when you would like PEOPLE PROJECT meetings to occur, when you would be able to participate, please contact us at (707) 442-7465 or peoplesarc@gmail.com. This was posted on July 5, 2010. 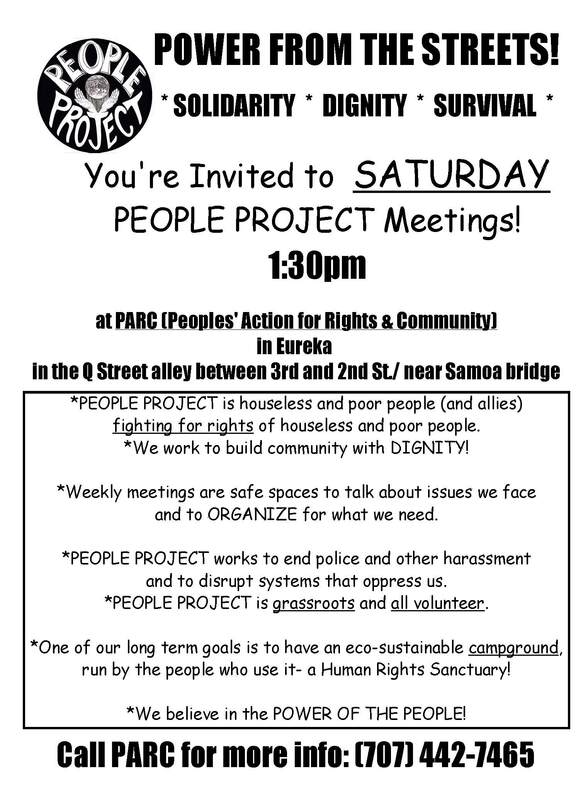 You’re invited to SATURDAY PEOPLE PROJECT meetings! *PEOPLE PROJECT is houseless and poor people (and allies) fighting for rights of houseless and poor people. *We work to build community with DIGNITY! *Weekly meetings are safe spaces to talk about issues we face and to ORGANIZE for what we need. *PEOPLE PROJECT works to end police and other harassment and to disrupt systems that oppress us. *PEOPLE PROJECT is grassroots and all volunteer. *One of our long term goals is to have an eco-sustainable campground, run by the people who use it- a Human Rights Sanctuary! *We believe in the POWER OF THE PEOPLE! This was posted on March 12, 2010. Weekly meetings will now be on Mondays at PARC [Peoples’ Action for Rights and Community], beginning at 1:30pm. On Tuesdays, we will be protesting to END THE WAR ON THE POOR in front of the Courthouse in Eureka, 3-6pm. YOU’RE INVITED TO MONDAY PEOPLE PROJECT meetings! PEOPLE PROJECT focuses on houseless and poor peoples’ rights & building dignified community. Monday gatherings are SAFE SPACES to discuss issues facing houseless people in our community. PEOPLE PROJECT works to safeguard against police and other harassment, always fighting for human rights. 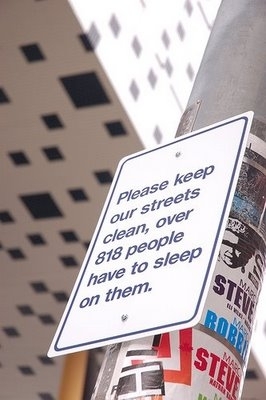 PEOPLE PROJECT is grassroots emphasizing the POWER OF THE PEOPLE, Power From The Streets! One long-term goal of PEOPLE PROJECT is to have a people-run, eco-sustainable campground -in an effort to create a dignified, safe, community space for houseless and traveling people- a human rights sanctuary! This (below) was posted on September 20, 2009. It’s about time again…open and active weekly PEOPLE PROJECT meetings! 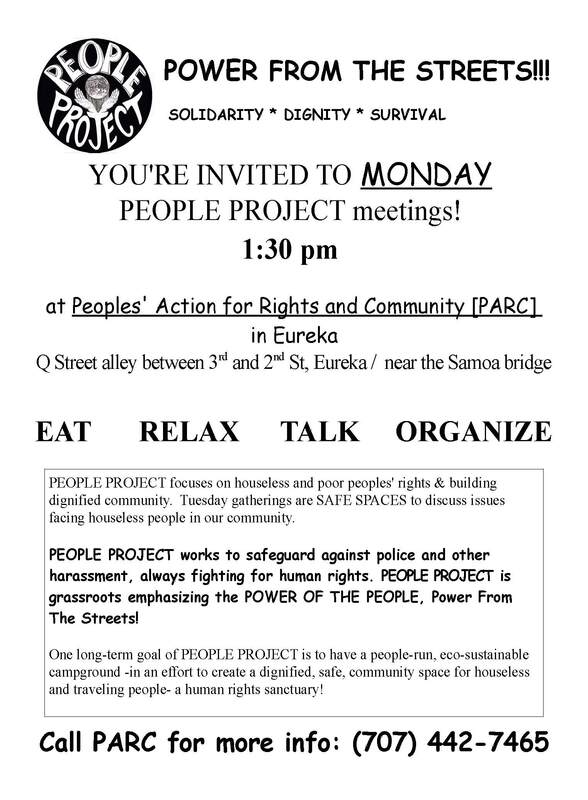 PEOPLE PROJECT met consistently for about 3 yrs in Arcata, but will start back up at this time in Eureka. It would be great to hear from you about what times and days you like for such gatherings/meetings. For now, meetings will be Tuesdays at 1:30 pm at Peoples’ Action for Rights and Community [PARC]. PEOPLE PROJECT focuses on houseless and poor peoples’ rights & building dignified community. Direct Action, sharing, and open dialogue are central to this grass-roots ‘project’. PEOPLE PROJECT gatherings are SAFE SPACES to discuss issues facing ‘houseless’ people in our community. One long-term goal of PEOPLE PROJECT is to have a people-run, eco-sustainable campground in an effort to create a dignified, safe, community space for houseless and traveling people, a human rights sanctuary! In addition, PEOPLE PROJECT works to safeguard against police and other harassment, always fighting for human rights. PEOPLE PROJECT is a grassroots effort, concept and group emphasizing the POWER OF THE PEOPLE, Power From The Streets! Food is shared and welcomed at PEOPLE PROJECT spaces. For the past year and a half, PEOPLE PROJECT has kept a community breakfast going in Eureka- every Tuesday and Friday- “Good Morning Neighbors!” Breakfast!! PEOPLE PROJECT will be working with People for a Human Rights Sanctuary to get a campground (human rights sanctuary) going in Eureka. Also, we will likely become an affiliate or member organization with the Poor People’s Economic Human Rights Campaign who has been, for years, organizing across color lines for economic rights- using encampments, housing takeovers, cultural and political education, marches, etc. dignified way, and organizing from a place of power! This was posted on September 11, 2009.
for about 3 years in Arcata, but will start back up at this time in Eureka. THE PEOPLE, Power From The Streets! Eureka- every Tuesday and Friday- “Good Morning Neighbors!” Breakfast!! cultural and political education, marches, etc. days for regular meeting/gathering times. PEOPLE PROJECT is now meeting at Redwood Park in Arcata. We gather at 6:30pm near the so-called ‘community building’ there near the parking lot and playground at the end of the 11th Street entrance to the park. If you are in a car and take the 14th Street entrance, and park in the lot, you only need to walk across the lawn to the meeting spot. All of the below info is still relevant!! We have not secured an indoor space for Tuesday night PEOPLE PROJECT meetings in Arcata. We’ve been sharing food, meeting, and playing music (at times) on Tuesday nights. Meeting on the cement OUTSIDE of a so-called public building which is warm, dry, empty, and locked… (and has a bathroom). Every Tuesday we eat delicious mostly vegan, mostly organic dinner, and most of the time, have hot coffee and herbal tea. Not only do we need to work on an indoor space (and bathroom) for Tuesday night meetings, we need to work toward a space for all who otherwise get caught in the rains, day and night. All are welcome for dinner, even if you do not wish to participate in a meeting. I’m not into having a free for all crash pad such as I’d visited during Earth First! activities I was a part of in I think ’96 or so, which was down just off of Wabash not too far on the away from the bay side of Broadway in Eureka, but more a mostly daytime resource of on-line computer, related and/or casual interesting reading materials, a toilet and shower, decent cooking facilities, and occasional over-night space for a few compatible individuals. I don’t know if anyone is aware of my politics, but thus as they are I’d call myself a theoretical if not too idiological communist pragmatic about other philosophys with similar goals. I joined the Communist Party USA in Berkeley while homeless there living out of my car in ’94, after being driven south with mild frost bite January of ’93 from Spokane. I’ve wanted to become “a card carrying member” since I was fifteen, so a nice fulfillment of a long held ambition, which is a rare enough experience for me, who mainly crab-like meanders very sideways through most everything. When I joined I was soon put into a relationship with then in his ’90s Jim Moore, who passed away a couple or so years ago just past 100, and who’d run for governer of Indiana in ’32 as a communist, while in jail for two years for his activism returning evicted tenant’s furniture and possessions to their rentals, from the sidewalk or street where the owners had dumped them. Jim seemed much less an idiologue than many others of the CPUSA I’ve encountered, who encouraged me to avoid reading great amounts of the available literature of Marxism and communism, but instead to endeavor to help people. I remember the impact on me of reading a book of his HOW I GOT OUT OF JAIL AND RAN FOR GOVERNER published by Regent Press of Oakland in his nineties, an “as told to” account of his life which really focused me on who and what Jim really was and was about. From a very early age(due to the poverty of his single parent father who had to place all four of his children with others for their care for a significant amount of time, amongst other reason) Jim had aquired an almost subconscious knack for the ability to recognise and also significantly help others suffering from oppression in various situations. Someone I remember as often wearing a FOOD NOT BOMBS button on his shirt or jacket, and who the last time I was in his Berkeley apartment when he was 99, had a large Rachael Cory poster on one of the walls. One of the significant things he told me about myself I’d never thought of before then, was that I was “a failure.” I’d been inured to a sense of hopelessness about everything I attempted, since the time I spent a year in a very acclaimed music school the ’70-’71 school year where I was undoubtably the worst of 2000 music majors. But, I’d never expected out of life anything but the levels of achievement I was used to, so to be told summarily I was a failure was surprising yet not in any earth-shaking way…since all my pursuits though in some way tainted in a way I’d never exactly defined though which I also recognised as my unique if not always very enjoyable lot, also drew my interest and carried me along as if threads of a most thread bare yet only garmet. This of course was alienating in many ways, but also has given me somewhat of an unusual perspective on human nature and particular individuals and social situations generally. If anyone is interested in a substantial aspect of how my character has been formed and functions. (analysis reveals a few significant factors, of a family mostly blue-collar or vaguely cynical medical professionals, though politically conservative in a democrat sort of way, who have been anything but supportive of my habitual radicalism, but who also tend to not go through life entirely wearing blinders either except for a pernicious religious orientation of the most niave which seperates us greatly; and that was what my mother only got into just before she would have a nervous break down. Also very influential have been “congenital/idiopathic” and juvenile spinal diseases, which I’d not been aware of at all until I was twenty-five, and which I was only wholey informed about also ten years ago-due to mis-diagnosis as well as manipulations by the medical establishment. (my father was a pharmacist and exceptional athlete who even at the age of 42 could high jump 5′ 6″) I’ve always been in situations where I had to deny and/or repress pain,(“growing pains” my father had told me when I’d complained) and for many years unconscious I was in any way different from others or that my pain was unusual; though at age of seventeen at 5′ 7″ I weighed 230# and had a 44″ waist and could not do a single sit-up, push-up or sit-up and ran the 11 yard dash in 21.4 seconds. Instead of any understanding, I was badgered as the sole cause of my deficiencies. Many years later, knowing my mother had never been allowed to nurse any of her children, due to doctors having told her that her milk would poison us; I was to find this not only is a totally fallacious medical practice one macrobiotic source I’ve seen labeled “partial euthanasia” but also a very common factor in creating muculo-skelatal problems and those of the upper respiratory system, both of which I’ve often suffered. *and with a not inconsiderable education, including North Texas University and Evergreen College, as well as a communal yoga study group of educated indigents called ANTAHKARANA CIRCLE OF HEALERS I became associated with the winter of ’77-’78 after leaving Evergreen a year before where I’d gotten my B. A.